I was all set to just find and share a great quote … one about fresh beginnings, or some inspiring way to say Happy New Year. Then this picture came to mind. 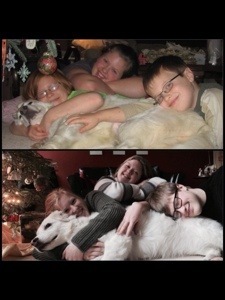 A ‘then and now’ picture of my beast and kids. A reminder of how time flies. Six years ago we took on the challenge of our (one and only … EVER) beast. According to the animal rescue center, she was found running on the streets of a city in a snowstorm, and was thought to be about a year and a half. From her first meeting with us, she claimed us as her own. Now at about seven and a half years, she is middle-aged, she needs a little glucosamine to keep her joints comfortable, and she still possesses us! Six years ago our son was just learning to read, loved LEGO, and was too short for many rides at the amusement parks. Now, at fourteen, he still can spend a day with those brightly coloured blocks, and now I look up to see his face. Six years ago our youngest daughter wore a short bob, was in her final year of elementary school, and saw boys and girls as the same. Now, at sixteen, her hair hangs at her waist, she has just a year and a half left of high school, and regarding boys … she’s got a favourite one. Six years ago our eldest was the age her sister is now. She spent her time reading, with friends or working at the pool. Now, at twenty-one, she still spends her time reading, with friends or working at the pool … but is fourth year in her university career, and starts her first internship this month with a great healthcare organization, and is looking at graduate schools in the East. Since ‘My Loves’ (pages) needed updating, and since I am returning to work this week, I thought I would give myself a bit of time to adjust to the rigors of the work week, by editing these pages this week. Besides, you might be reading this and have never had me introduce those who are nearest and dearest to my heart! Today I will share about ‘The Beast‘ (click on those two words and it will link you to the page). The dog in our home, like my Hubby, is only known on itsawonderfilledlife by the name of the Beast. I think I will continue to keep their ‘real’ identities a secret (and hubby just asks that I never confuse the two names when writing …). She is now about eight years old … I think she must be about my age in dogs years, as we both benefit from the regular intake of glucosamine, and we both like the idea of daytime naps (she takes them, I just look on longingly). She is my Stalker, who follows me from floor to floor, and room to room. It’s the most wonderful time of the year … and I do not mean that it is Christmas (my hubby is known to sing this song the first day back to school … cruel man). I am, of course, referring to summer. I am slowly (ever so slowly) getting parts of the house cleaned, renos. started, new recipes researched, and fun things underway with the family. The beginning of the summer break can be ever so messy. I am simply so very excited to have a significant amount of free time that I try to do everything that I want to … all at once! Just last week I started to clean out the bedroom of an international student who is not returning, I also started to clean my bedroom closet, I also started pruning my grapevine, I also took one of my kids for lunch, took in a sale at a store, and cleaned out the cabinet where I house candles and their holders. The result of my ADD (attention deficit disorder) behavior was a very messy house. Stuff from my closet ALL over the bedroom, and streaming from it into the kitchen and living room. Stuff from that student’s bedroom streaming all over the hallway outside of it. The can holding yard trimmings in the middle of the backyard. My coffee table full of candles and their holders. Bags of purchases from the sale on my bedroom floor. And dirty floors … how could I possibly have time to clean when I am out, or cleaning, or organizing? I feel as though my actions mirror the excitement my beast experiences when the door is left ajar, and she runs with joyful abandon. It is the freedom availed after being locked in to the busyness of the ten months prior that causes this crazed activity. Now that the initial excitement is over, I can truly relax, and enjoy … no, savor the freedom that summer brings. That reminds me of our beast too. Once she has been out and running like a race horse, mouth hanging open like she is crazed with excitement, she returns home, chooses the most lush part of our front grass (moss), under the shade of the trees, and she simply lays their, with the appearance of the biggest dog smile across her face. So, now that I am into week two of the summer break, I too am searching for an equally lush and shady place, to enjoy the freedom … the freedom of rest. A good old walk will clear any befuddled brain, and that is what I did when the rain halted, and the sun came out to fill us with it’s energy giving Vitamin D.
I was feeling good, and my beastie at my side was smiling (if you could see her face when we are out for a walk, or, for that matter when she hears the word WALK, you too would agree that she is smiling … but, I digress). The sky was actually a beautiful bright blue, a nice change from the shades of gray that we normally face here on the Wet Coast during monsoon season West Coast during winter. I knew my brain was befuddled, because I kept making errors in my responses to people, as we walked. As one couple passed and said something complimentary about my beastie (which caused swelling of her head to the point that I had to grease her head just to get her back in the van … but, I digress), to which I replied, “oh, she thinks she is a laptop.” A laptop? Seriously? I had meant a LAP DOG, but that is not what came out of my mouth. Unfortunately, I did not realize my error of words until they were too far gone in the other direction for me to correct myself. I wonder how far they had gone before they realized what I had said? I wonder if they called emergency services to report a weirdo on the trail? The walk was full of people with smiles on their faces, drinking in the sun and warm breezes. Most were shouting out happy greetings, and all commenting on the beauty of the day. This is a West Coast survival technique. It could have been raining for a month straight, but as soon as the sun comes out, so do all the people, smiling and declaring how lucky we are to live in such a beautiful place, and that we do not have to deal with snow. I believe there is a psychological diagnosis here, waiting to happen (I’m betting that there are more prescriptions filled in the lower mainland for Prozac than the rest of snowy Canada combined! Again, I digress). So, as I am passing happy person, after happy person, and to one I initiate a greeting, “good morning.” And in those two words, I have let it be known that I have, indeed, lost it. It is four in the afternoon! Sure one could make a mistake at one o’clock with saying good morning, but no, I did so a good four hours into the afternoon. What was worse was that I felt I needed to correct myself, but my verbal language skills were so lacking that I just sounded like I was speaking another language. I am sure the poor person kept walking, faster than before our chance encounter, figuring that I was on drugs! I began to question whether or not I might have had a stroke … but, alas unintelligible speech was my only symptom. Sigh … this is why we frail human beings need to own a beast. They cannot understand more than three words (walk, eat, treat) in English, and they love us … in spite of our befuddled brains. Maybe next time I will just let the beastie do the talking. For those whose birthdays are near December 25th a common experience is shared. That of receiving one gift with a ‘Merry Christmas / Happy Birthday’ message. That has been the experience of my hubby. So, for today, I will digress from my December of Christmas themed posts just for him. Today hubby will awaken to his fortieth birthday (with a significant number of years of experience … just sayin’). You, hubby, are a person who is always doing something for others. You empty your cup daily with little hope of it ever being re-filled. You give and give and give, with little thanks for all that you do. To our kids you are the one they can count on. When they have a need, you have a solution. They have grown up knowing that they are deeply loved by their dad. To me, you are my best friend (and best enemy … it depends on the day … I’ll never get a job with Hallmark!). You are the one who I want to tell my best and worst experiences to. It is you who I know will always be there (no matter what I might do to get you off my trail 😉 ). It is with you that I have shared the majority of my life with, and it is with me that you will continue to share the rest of yours with (that is true, right?). To our beast … well, you haven’t evicted her (yet). A good morning coffee time. A day of receiving love. A day of positive words from others. A day of being thankful for the day. A day of no barking by the beast. A day of no crises. A day of feeling valued in all that you do. See you in the early morning hours.